The four days spent at Lovina Beach seemed to fly past. This was ‘recharging’ my battery time! In our morning practice next to the pool I would lie in Savasana and gaze up into the cloudless sky sky framed by the brilliant colours of the bougainvillaea. The sound of the motor scooters buzzing back and forth along the dirt track behind the Villa Jaya didn’t seem to intrude. Some mornings I would put fallen blossoms around my Yoga mat; frangipani and bougainvillaea. Suraya Namaskar takes on a new meaning when practised in this environment. After our class the three of us would sit down to a hearty breakfast; banana pancakes, two eggs and toast and as much Bali Kopi as we wanted. Bali breakfasts feature in all my Bali blogs! On the topic of food, while we were in Lovina, we had a cookery class/demonstration with Michele’s friend Komang and her husband Gobang. Komang and Gobang live in Lovina, a short distance from our hotel so on the evening of our class we walked over to their home. Preparation for dinner was already well under way. Their middle son (age about ten if I remember correctly) was helping his parents with the preparations. Apparently he loves to cook. I am constantly amazed at the feasts that the Balinese produce from just a small cook top or even just a couple of burners. This demonstration was no exception. Some of the food for our feast. In Balinese style we sat on the floor and used our fingers to eat. There was a big bowl of rice and a bowl of water to rinse our fingers. The food was spicy and delicious! The corn fritters were especially popular. I have the recipes now but haven’t got round to trying them out yet. Gobang’s mother who also lives in the compound popped her head in to see us and Komang’s oldest son came in from playing football with his friends but didn’t stop to say hello! Bali was agog with the World Cup taking place and so many of the children and the men were following the teams with great fervour! Flags of all nations decorated the streets and everyone had a favourite team. More later – now that I’ve got time to sit down and write. Thanks Michele for the itemised itinerary you gave me! Together with my Moleskine I’ve got it all together. Kawi’s morning Yoga class at the Ashram Gandhi in Candidasa included a variation on the Warrior (or Hero) asana that twists the torso and the upper arm rests on the thigh, hands in namaste. I remember learning this a long time ago and so enjoyed re-remembering. I did try and sketch the posture but it didn’t really work. I’m hoping I’ll pull it out of my knowledge base if I ever decide to teach it. 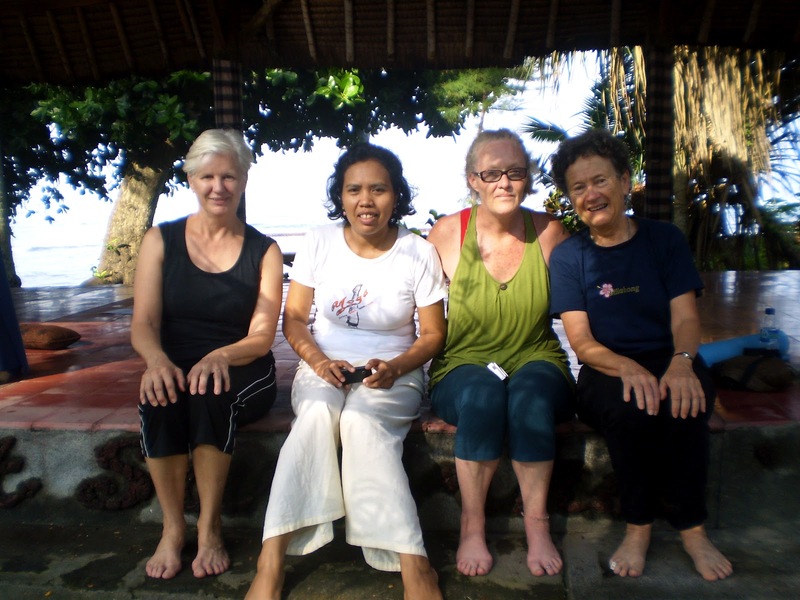 We left for Lovina Beach after breakfast with a break for lunch in Singaraja, which was the capital of Bali under Dutch occupation. So much of Singaraja reminds me of areas of Cape Town, South Africa, especially around Observatory and the Malay Quarter. We had lunch on the pier at the harbour; good, fresh food and a splendid view. 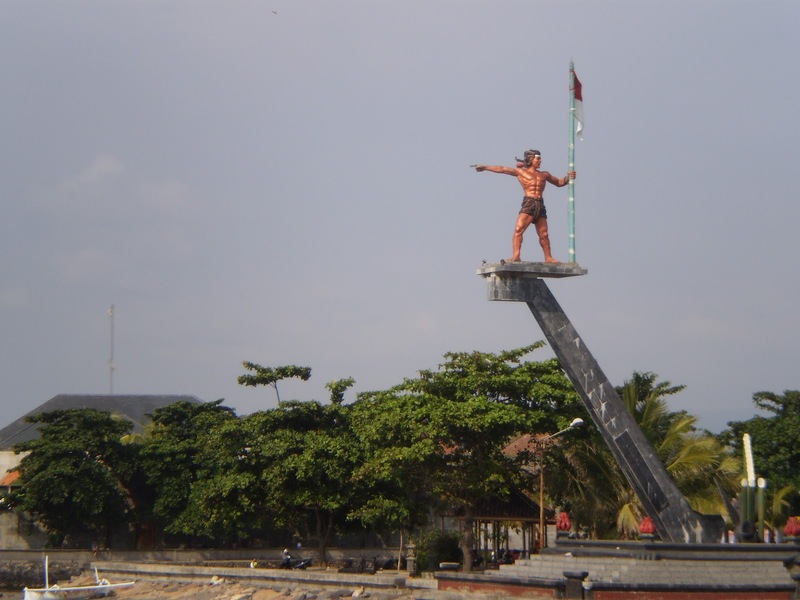 The Balinese Hero of the Revolution is commemorated in an amazing statue. Balinese memorials are not of the subdued, concrete grey that we in the Western world are used to; rather, they are bright and strong. I don’t know if anyone else remembers learning about the ancient Greek and Roman statues which were, apparently, equally as colourful but over the centuries the colour has faded and gone and now we accept that these works of art were created in shades of grey. I guess that if the people had continued to worship the goddesses and gods regularly, the statues would have been repainted and kept colourful. One thing travelling the by ways and back ways in Bali are the frequent stops for Hati Hati (Caution: direct translation, ‘heart, heart’). The stops are not only for road works (of which there are many) but also wedding processions and funeral processions. These events are so full of ceremony that traffic has to stop to allow the procession to pass. The funeral processions are particularly awesome with massive models of bulls or whatever the caste of the deceased demands. The nearest equivalent I can think of here in Australia is when we pause to allow a hearse to pass. We arrived at Villa Jaya – one of my most favourite places, in the afternoon. This small hotel, only six or seven rooms and reached through one of the Bali portals (miss the turn-off down a narrow powdery white gravel road and you’ve missed a journey into another world). Since last time I stayed at Villa Jaya the stairs to the second story rooms have been altered and retiled. I’m happy about this because they were very steep and the risers were high. The old dog who lives at the hotel still sleeps in the sun on the landing or on the doorstep of the first room at the top of the stairs. As you step over him he looks at you with a sorrowful stare! Our four days here, at Lovina Beach, have to be among the highlights of the Bali trip and I’ll tell you more about it in the next instalment.